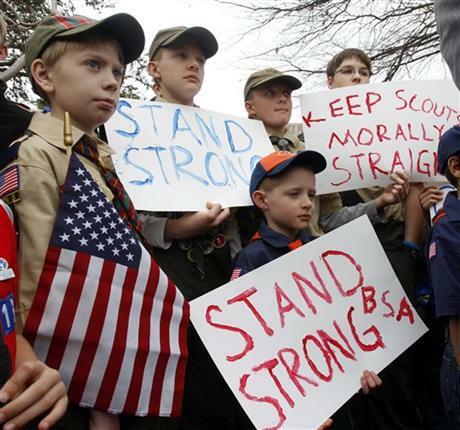 I recently came across this article talking about the Boy Scouts Association of America, and the decision currently up for discussion by their board – should they let gay children be part of the BSA and should they let gay parents be troop leaders? Actually, the proposal up for debate is should the local troops be allowed to decide for themselves whether to allow gay membership – something which is not currently allowed. Their existing policy is to exclude all known gay children and adults. The BSA couldn’t make a decision, due to the complexity (and the strong arm tactics by various groups) and have put a decision off until May. I am appalled by this on so many levels. First of all, this organisation, supported by many Christian groups and with a strong moral stance, is excluding children who want to participate and parents who are willing to help give their children and others a wonderful series of experiences and life lessons. Secondly, that the church groups, these so-called Christians, are saying that if the BSA allow gay troop members and leaders, they will withdraw all financial support. So much for doing unto others as you would have them do unto you. What are these people so worried about? Do they think that gay children will corrupt their own or that gayness is catching? Do they think that gay adults are all paedophiles, or is it just their lifestyle choices that they think are questionable? But the thing that appalls me most, personally, is the picture at the top of this article. Look at the age of these boys. Already, they have been taught to hate those who are different. They’ve been told, it seems, that being different is wrong. What a terrible message. How would I feel if one of my children told me they were gay? Well, in some ways I’d be a little sad, because life can be just that bit harder for a gay person, even in our supposedly enlightened times. But for the most part, I want my children to be happy; to love and be loved and whether they are gay, straight or otherwise makes no difference to that hope. They will still be my child, no matter what. Love is love is love, and in my eyes, the more love in the world, the better place it will be. The BSA is being cowardly, exclusionist and outdated, and they are teaching their 2.7 million youth members that this belief system is valid. Shame on you, BSA, shame on you. Here’s a great post from Ask Your Dad on this topic. And in a related post, here’s his letter to his hypothetically gay son. John Kinnear lives in Utah, and has a great feeling for how things are in that neck of the woods. Couldn’t agree with you more, FMNZ. Amen. Thanks Tobi! I felt strongly moved by this!